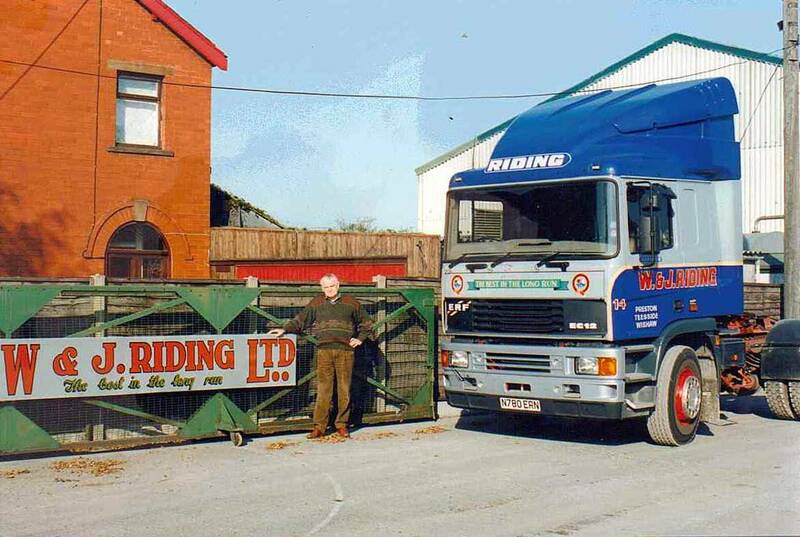 On Saturday the 28th of October 1995, after 25 years as managing director, Tom Riding retired from the company. Within months after his retirement the familiar grey and blue livery of W & J Riding's tractor units was changed to either the scarab green or Nexus blue livery of the Transport Development Group Ltd, while many of the plain white liveried tractor unit's, assigned to the EVC contract, had their Riding headboard's replaced with the TDG Nexus logo. 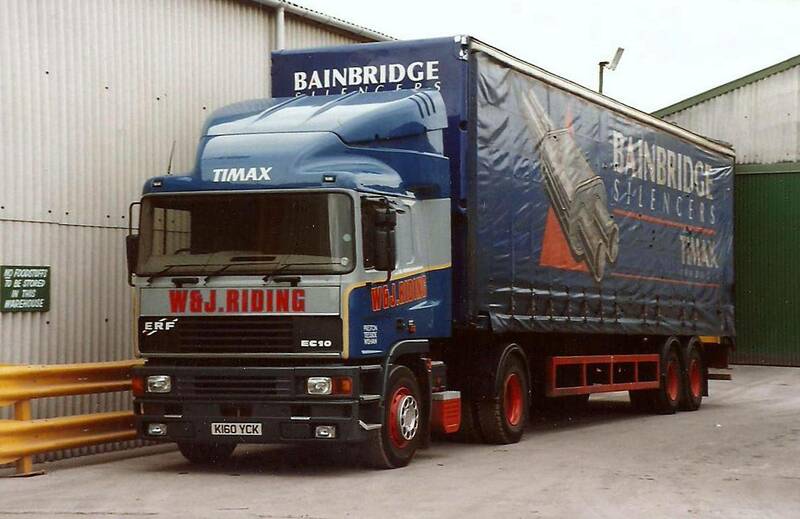 The fleet number's and individual tractor unit names were all removed thus consigning the long established haulage company of W & J Riding to the history books. Due to the vast amount of trailer's operating in the fleet, it would take quite a few years more for all of them to finally lose their W & J Riding identity. Saturday the 28th of October 1995 and managing director Tom Riding took this photograph of the main entrance to the depot on the day of his retirement from the company. 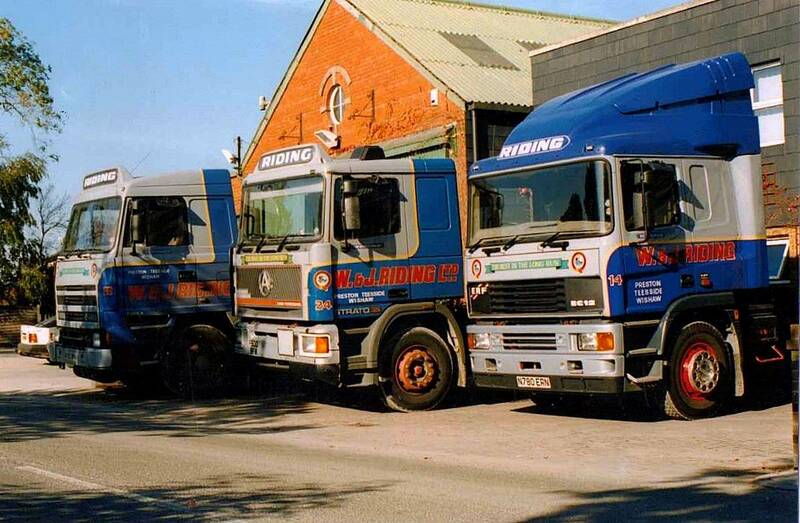 Taken by the late Michael Deuchars on the last weekend before Tom Riding retired in October 1995 it shows three of a kind parked up outside the office block at Longridge depot. 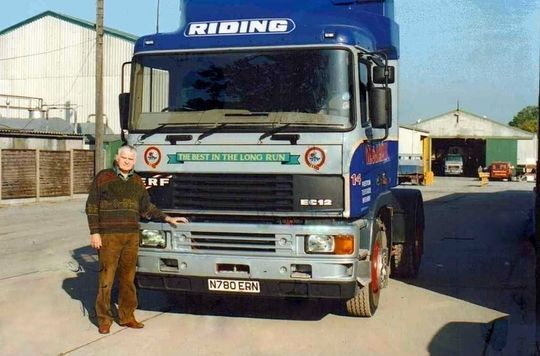 Tom Riding is pictured on his last day at work next to the gates of Longridge depot in front of ERF 4x2 tractor unit Reg No N780 ERN Fleet No 14 ' Hotspur'. This particular ERF, registered new on the 1st of September 1995, was the last vehicle that Tom Riding ordered and had been delivered shortly before his retirement the following month. The photograph above was taken the actual day Tom retired from the company on Saturday the 28th of October 1995. Photograph courtesy of the late Michael Deuchars who sadly passed away on the 17th of July 2013. 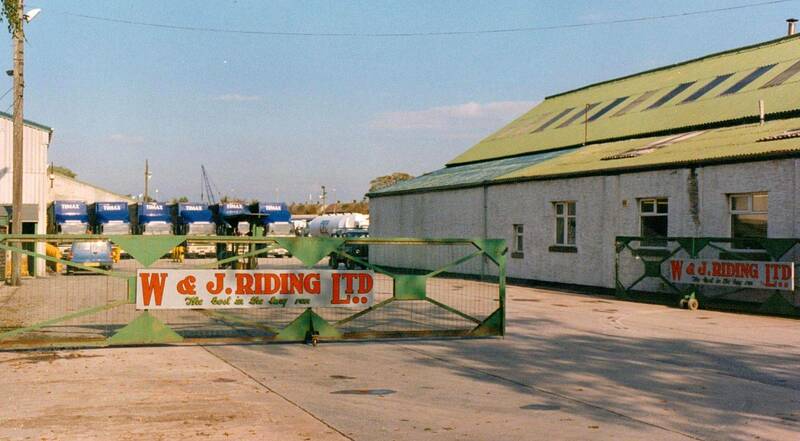 Another shot taken on Saturday the 28th of October 1995 the day Tom Riding retired from the company. He is pictured at the entrance to Longridge depot standing next to ERF 4x2 tractor unit Reg No N780 ERN Fleet No 14 ' Hotspur' which had only been registered new the previous month on the 1st of September 1995. 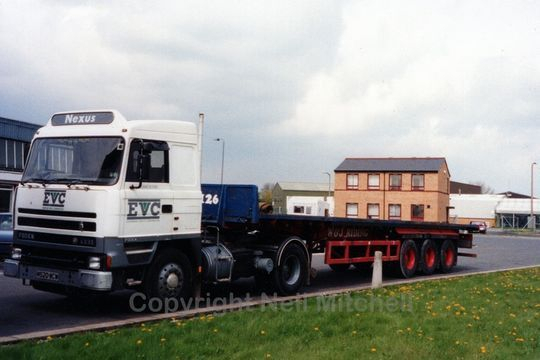 Within five weeks of Tom Riding's retirement 'E' Series ERF 4X2 tractor unit Reg No K350 EEO Fleet No 23 'Auld Reekie' was in the first batch of ERF's to receive the horrid scarab green 'Transport Development Group' livery. Seen here in December 1995 it had just come out of the paint shop and was yet to have it's TDG graphics applied to the doors and front panels. December 1995, just two months after the retirement of Tom Riding, and Seddon Atkinson 401 Series 4x2 tractor unit Reg No VPM 235Y Fleet No 61 ' Highland Laddie' looks in a very sorry state shortly before being scrapped. 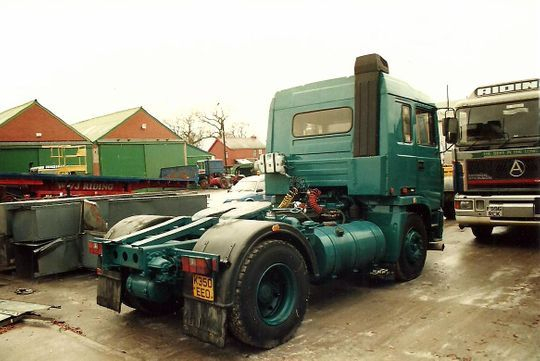 Registered new on the 1st of August 1982 Tom Riding bought it second hand from London Carriers in April 1987 for £4,500 plus vat unfortunately on arrival at Longridge it was found to have a crankshaft problem but this was quickly sorted out. After being scrapped the Cummins E290 engine was removed and sold to Hatwood exports. 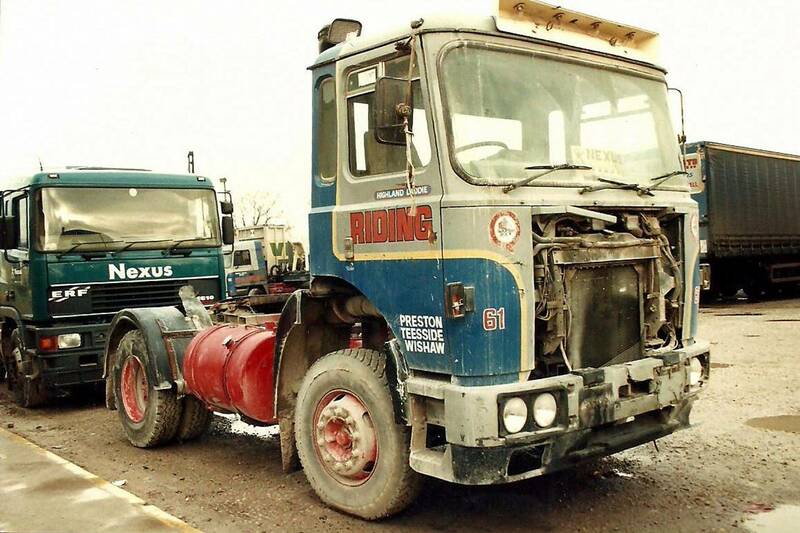 Seddon Atkinson Strato 4x2 tractor unit Reg No G750 UEC Fleet No 7 'Indomitable' was was powered by a Perkins TX engine. Registered new on the 1st of June 1990, at a cost of £32,882 plus vat, it was driven from new by Rodney Preston. Seddon Atkinson Strato 4x2 tractor unit Reg No G750 UEC, formerly Fleet No 7 'Indomitable' in the Riding fleet, is seen here on the 4th of May 1996 after receiving it's new scarab green TDG livery. 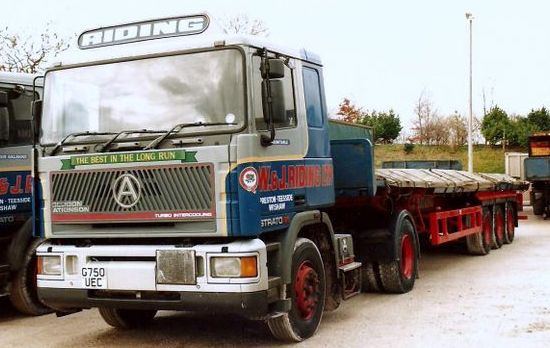 Within a few months, after Tom Riding's retirement, the whole tractor unit fleet were very quickly re-branded into to Transport Development Group livery thus consigning the famous transport company of W & J Riding to the history books. An on the road shot of day cabbed Seddon Atkinson Strato 4x2 tractor unit Reg No G916 UYV formerly Fleet No 80 'Majestic'. 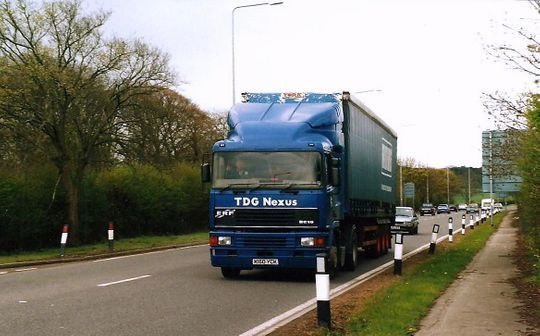 Seen here in 1996, after being in service for the previous seven years, the Riding headboard has been replaced by the TDG Nexus logo as the W & J Riding identity slowly begins to disappear after the retirement of Tom Riding the year before in 1995. 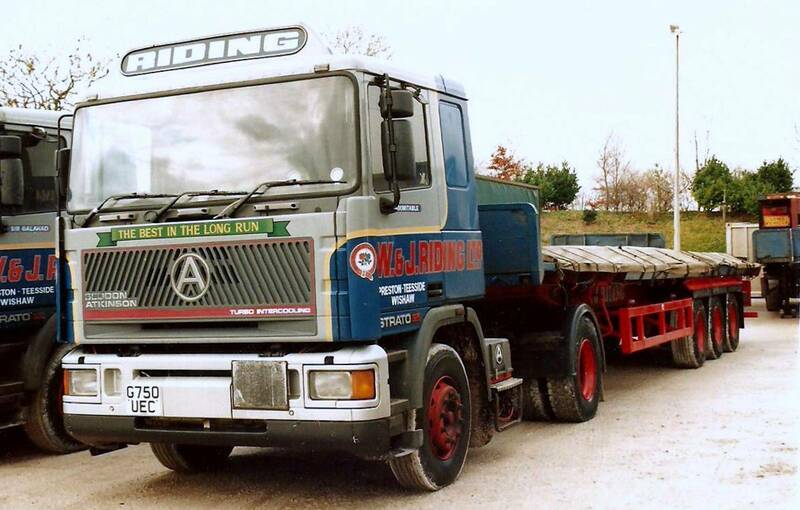 Registered new to Riding's on the 1st of September 1989 Seddon Atkinson Strato 4x2 tractor unit Reg No G881 GFV was powered by a Cummins 14 litre engine. 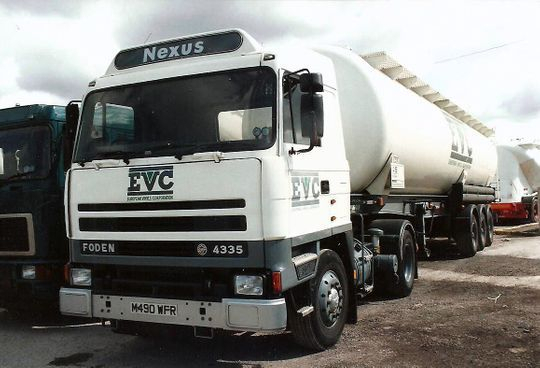 Formerly Fleet No 95 'Morning Star' it is seen here having lost all of it's Riding identity and now in the Nexus contract livery of European Vinyls Corporation (EVC) while coupled to a 2000 cubic foot Metalair tipping tank. ERF EC10 4X2 tractor unit Reg No K160 YCK. Driven by Ronnie Williams it is seen here on the A585 Garstang New Road Little Singleton near Blackpool in April 2000, seven years on after first originally entering service with W & J Riding. 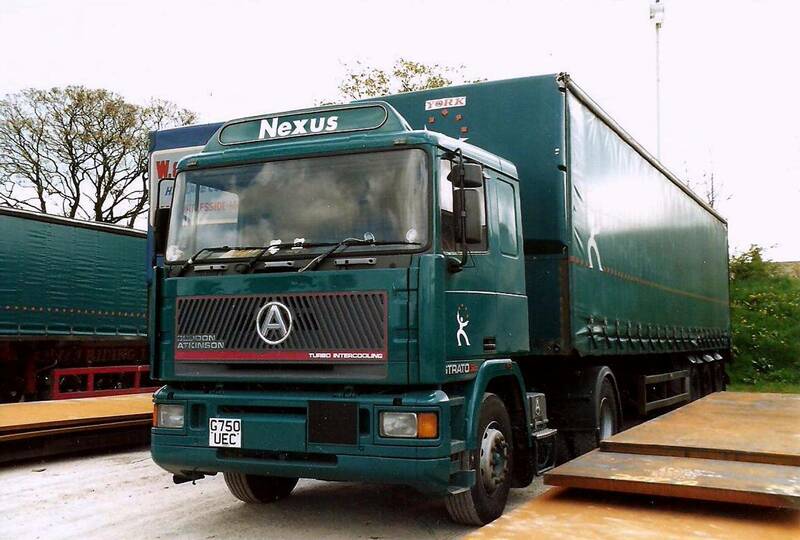 Now in blue TDG Nexus livery it is hauling a tri-axle curtain-sider trailer, still in the former W & J Riding livery. 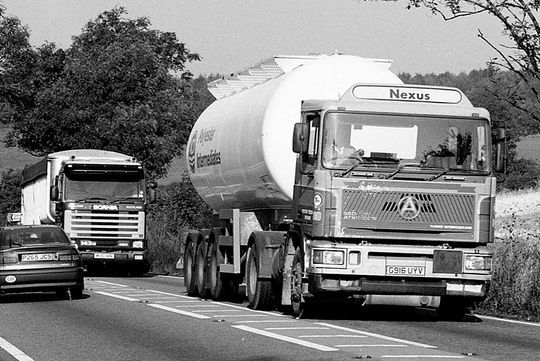 pictured here on the right, this particular ERF tractor unit was in the very first batch of the EC series produced at Sandbach in May 1993 and was used as one of the launch vehicles on the 11th of June 1993. Foden 4x2 tractor unit Reg No M960 RRN Fleet No 32 'Illustrious' was the second Foden 4x2 tractor unit that Riding's bought, joining the fleet on the 24th of September 1994. 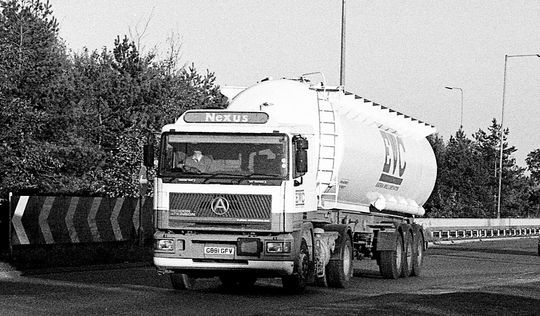 It is seen here after being in service a couple of years on the M62 Hartshead Moor service area in West Yorkshire with a freshly painted Carmichael 2000 cubic ft non tipping powder tanker in Nexus livery. Within a short period of time, after the retirement of Tom Riding in October 1995, all the powder tankers in the fleet were re-branded into TDG Nexus livery. Foden 4335 4x2 tractor unit Reg No M490 WFR Fleet No 63 'Great Britain' was registered new on the 1st of April 1995. Powered by a Perkins 335 TX engine it is seen here parked up in the depot at Longridge the week that Tom Riding retired in October 1995. Foden 4335 4x2 tractor unit Reg No M490 WFR was formerly Fleet No 63 'Great Britain' in the W & J Riding fleet. Registered new on the 1st of April 1995 it seen here in May 1996 after losing all of it's W & J Riding identity but keeping it's European Vinyls Corporation Ltd livery. 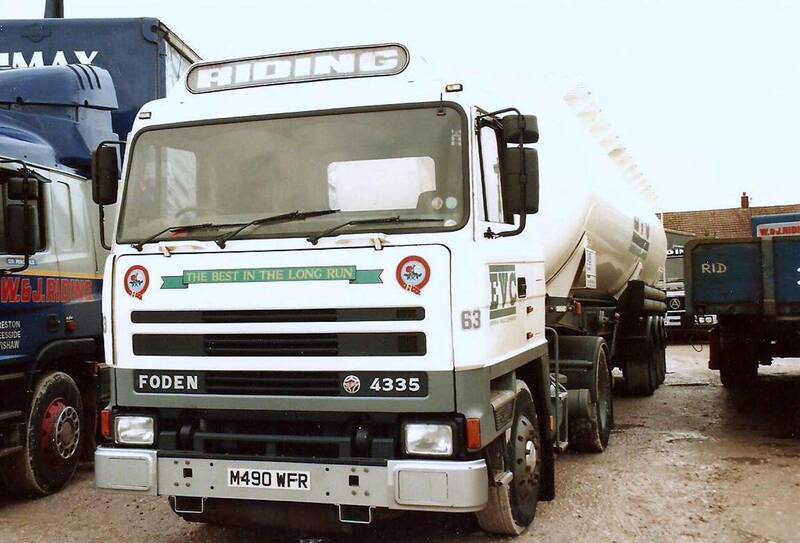 Foden 4335 4x2 tractor unit Reg No M520 WCW Fleet No 67 'Thane of Fife', which was registered new on the 1st of April 1995, is pictured here in 1999 at Kirkham Heavy Goods Vehicle Testing Station. 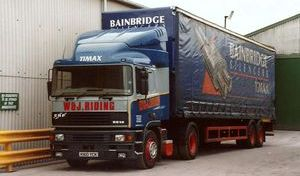 Seen here four years after Tom Riding's retirement from the company the W & J Riding legacy still lived on. Although the Riding headboard of the Foden had been replaced with a TDG Nexus logo and it's fleet number removed the 40 foot tri-axle flat trailer must have been one of the very last to remain operating in it's original W & J Riding livery by this time in 1999. 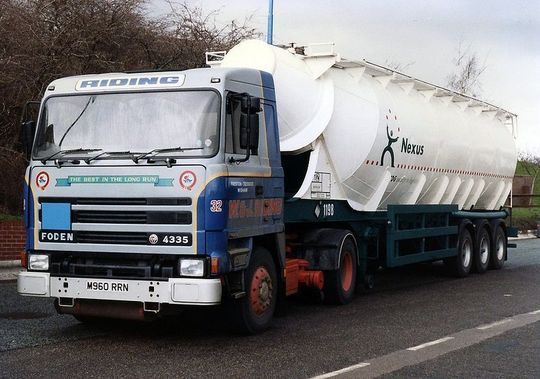 All of the powder tanker and curtian-sider trailers were re-branded between 1995 and 1998. Photograph courtesy of Neil Mitchell.